Peter Byrne (right) and Conor Mahony (left) performing on the White Horse stage at the 2017 Doolin Folk Festival for the launch of their CD, Land and Sea. ‘Land and Sea’ is the atmospherically titled inaugural album by Conor Mahony (guitar) and Peter Byrne (vocals). Launched on the Whitehorse Stage at the Doolin Folk Festival 2017 by Christy Moore’s brother, the singer/songwriter Luka Bloom, this release encompasses all that is best about Traditional Music and truly brings the spirit of Irish Folk alive. Though their musical collaboration, recently celebrated at the Doolin Folk Festival, only began two years ago, both artists had previously spent a good number of years building well-deserved reputations for excellence within their respective specialities on the traditional music scene in Ireland. Local Dublin man Peter Byrne is a long-standing contributor to folk music in the city. He’s a familiar and much-loved face at such well-known clubs as Mother Redcaps Tavern (where he and his wife Eilish Moore put on a popular Saturday night folk club for more than a decade) and The Meeting Place. A quiet and thoughtful person, Peter’s modest demeanour does not hint at what is a truly rare vocal talent. His voice has the power to enthral and captivate all those who are lucky enough to have an opportunity to listen to it. Peter met Kildare man Conor, who was already a highly acclaimed folk guitarist, not long after he retired from CIE, and they soon started to play and rehearse together on a regular basis. It quickly became clear to both of them that the natural talent of each perfectly complemented the other and that together they were producing music that was something really special. Peter’s singing style is immersive. He doesn’t simply sing – he is a vocal storyteller who fully inhabits the world where his characters live. His laid-back demeanour and charm never fail to captivate an audience as he leads them on what is often a roller-coaster emotional journey of song. 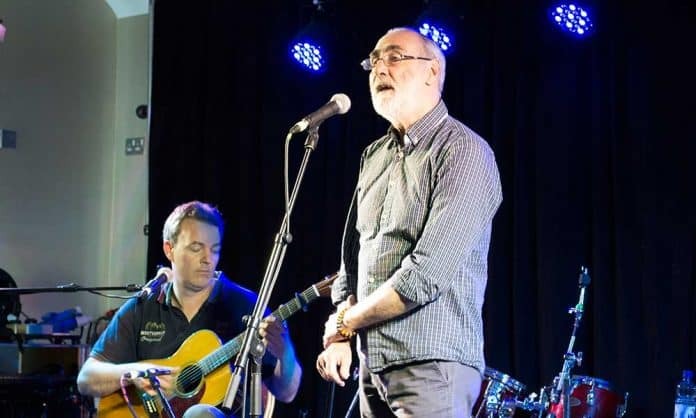 No one connects with an audience like Peter Byrne, and it is a rare musician indeed who is able to capture with such thrilling poignancy the feelings of those about whom he sings. Singer/songwriter Conor Mahony has been playing guitar since he was a boy, honing a love of traditional/roots and classical music alike. His wonderfully intricate arrangements serve to elevate his guitar playing to new heights, enhancing the beauty of each individual song and making a lasting impression on his audience. Today, Peter’s vocals, paired with the Conor’s lyrical and beautiful guitar playing, have resulted in an album of rare beauty. 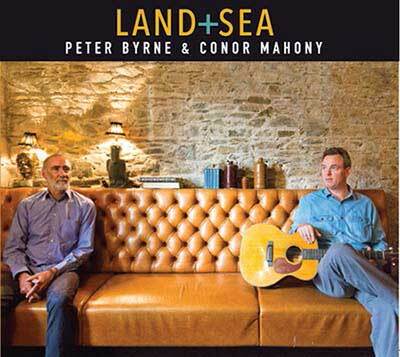 The new CD, ‘Land and Sea’, from Peter Byrne and Conor Mahony. ‘Land and Sea’ is a collection of largely traditional pieces that explore the album’s title. The first track, ‘Lord Franklin’, is a showstopper. Arranged by Conor, this version manages to subtly pay tribute to Mícheál ÓDomhnaill’s definitive version whilst retaining an identity all of its own. Another highlight is ‘Lonesome Robin’. This song, penned by American artist Bob Coltman, narrates the story of the demise of the heroic outlaw Robin Hood. Incidentally, it was this song that originally brought Conor and Peter together. Having met at a party one night, and watched each other perform a song or two, they bonded in a corner by discussing music. Conor idly played the opening chords of ‘Lonesome Robin’, never expecting what happened next. Peter started to sing along sensitively and lyrically, leaving Conor in no doubt whatsoever that he had found the perfect musical partner. It is this amazing connection that shines through all the tracks on the album. ‘Land and Sea’ also features two of the late great Harry O’Donovan’s songs: ‘Daffodil Mulligan’ and ‘The Charladies Ball’ (a live version of the latter is available to view on YouTube). In addition, Peter’s performance of ‘The Isle of St Helena’ (a song he discovered via Frank Harte) is sublime, and the accompanying guitar is played wonderfully by Conor. The old classic ‘Mary and the Soldier’ appears here stripped right back, and all the better for it. The album also features versions of ‘The Death of Queen Jane’, ‘They’ll Never Believe It’s True,’ ‘The Water is Wide’, and ‘The Heart of Saturday Night’ (see YouTube for a simply stunning live performance). Land and Sea, launched to critical acclaim at the Doolin Folk Festival, was engineered and produced by the highly skilled and acclaimed Frankie Lane (formerly of The Fleadh Cowboys), who also sings harmony and plays ukulele and dobro on a number of the folk tracks. Peter’s son, Conor Byrne, a celebrated flute player in his own right, also appears on two tracks, while his wife Eilish sings on a charming arrangement of the traditional music favourite ‘My Singing Bird’. This, the first collaborative release from the two artists, is an album upon which much attention and care has been lavished. Everything from the initial song selection to the careful arrangements and the performances themselves speaks of a lifetime of experience. Since its release, the album has received rave reviews and a great deal of airplay. In summary, Land and Sea blends innovation with tradition, and the result is a traditional music record that is simultaneously raw, delicate and wholly memorable, and its reception at the Doolin Folk Festival is a testament to this.